So I've finished the second draft of my book. Now comes the hard part - the dreaded synopsis. Why is it easier to write an 80,000+ word novel than it is to write a teeny, weenie synopsis? Seriously, why? I need to know. 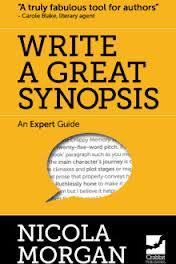 Because I'm relatively normal, I dread the dreaded synopsis so I decided to get some help and bought Nicola's Morgan's 'Write A Great Synopsis'. I've read through it and made notes so I'm ready to go. Aren't I? *musters fake confidence* Yes, I am! Oh, I HATE writing synopses! *shudder* Good luck! That is because you're normal too. Synopses are the devil.